Preface. Acknowledgments. About the authors. Glossary of main symbols. Unit conversion factors. 1. Introduction and overview. 1.1 Geophysics for exploration and drilling. 1.2 Conventional borehole seismic methods. 1.3 Motivation for seismic while drilling. 1.4 History of the use of the drill-bit signal. 1.5 Overview of the different approaches to SWD. 1.6 Seismic-while-drilling method. 1.7 Main products obtainable while drilling. 1.8 Measurement while drilling and SWD perspectives. 2. Principles of drilling. 2.1 Introduction. 2.2 Drilling a well. 2.3 Main well components. 2.4 Drilling offshore. 2.5 Directional and deviated wells. 2.6 Designing a well. 2.7 Classification of drill-bit types. 3. General theory: drill-bit seismic waves. 3.1 Introduction. 3.2 Reciprocity principle. 3.3 Normal while-drilling VSP. 3.4 Drill-bit seismic source. 3.5 Total drilling power. 3.6 Energy analysis in terms of drilling parameters. 3.7 Energy balance in rock fracture. 3.8 Radiation of energy from the bit (far-field effects). 3.9 Near-field effects. 3.10 Balance of the borehole and radiated power. 3.11 Drill bit versus conventional seismic sources. 3.12 Roller-cone bit as a periodic vibration source. 3.13 Roller-cone bit as a wideband seismic source. 3.14 PDC bit as a vibration source. 3.15 Analysis of PDC single-cutter forces. 3.16 Dynamic variation of PDC-cutter forces. 3.17 Summary of large bit-vibration modes. 3.18 Bit vibrations induced by mud pressure modulation. 3.19 Numerical examples of drill-bit vibrations. 3.20 Radiation properties of conventional sources. 3.21 Radiation from drill-bit and conventional sources. 4. General theory: drill-string waves and noise fields. 4.1 Introduction: drill-string vibration analysis. 4.2 Drill-string waves. 4.3 Attenuation of extensional waves. 4.4 Waves periodic and non-periodic drill strings. 4.5 Drill-bit mud waves. 4.6 Coupled pipe-mud-formation guided waves. 4.7 Summary of drill string waves. 4.8 Surface/rigsite noise wavefields. 4.9 Drill-string noise and borehole interactions. 4.10 Drill-string transmission line. 4.11 Bit/rock reflection coefficient. 4.12 Dual fields in the drill string. 5. Acquisition of SWD data. 5.1 Introduction. 5.2 Signal recognition and acquisition layout. 5.3 Pilot sensors and transducers. 5.4 Surface pilot sensors (rig pilots). 5.5 Downhole pilot sensors. 5.6 Use of dual sensors in drill strings. 5.7 Other pilot sensors at the rig. 5.8 SWD data-acquisition system. 5.9 SWD-data acquisition and drilling control. 5.10 Drilling depth and seismic depth. 5.11 Spatial sampling of SWD signals. 5.12 SWD-source pattern with bit deepening. 5.13 Onshore acquisition. 5.14 Receiver arrays in SWD. 5.15 Acquisition of shear and converted waves. 5.16 Survey preparation procedures. 5.17 Survey operations. 5.18 Summary of quality-control procedures. 5.19 Onshore 3D-SWD acquisition. 5.20 Offshore acquisition. 6. Preprocessing of SWD data. 6.1 Introduction. 6.2 Preprocessing. 6.3 SWD data in the crosscorrelated domain. 6.4 Stack of while-drilling data. 6.5 Deconvolution of the drill-bit source function. 6.6 Pilot deconvolution. 6.7 Discussion about pilot deconvolution. 6.8 Beam-steering deconvolution. 6.9 Deconvolution in rotation-angle domain. 6.10 Modeling of drill-string response. 6.11 Fitting with real data. 6.12 Drill-string waves in the correlated and deconvolved data. 6.13 Interpretation of drill-string multiples. 6.14 Rig ghost. 6.15 Processing of dual drill-string wavefields. 6.16 Pilot-delay correction. 6.17 Signal rephasing. 6.18 Example of preprocessing parameters. 7. Processing of signal and noise RVSP fields. 7.1 Introduction. 7.2 Entropy and repeatability of the drill-bit source. 7.3 Common-level stack of correlations with noise. 7.4 Selective stack by drilling parameters. 7.5 Noise cancellation by orthogonal pilot traces. 7.6 Noise separation by independent pilot traces. 7.7 Analysis of torsional pilot waves. 7.8 SWD with downhole-motor drilling. 7.9 RVSP processing of SWD-VSP seismograms. 7.10 Analysis of impulsive drill-bit signal. 7.11 Correction for geophone group-array filters. 7.12 Other SWD methods based on correlation. 8. Applications. 8.1 Introduction. 8.2 SWD products. 8.3 Drilling and real-time migration. 8.4 Deviated-well monitoring. 8.5 Geological and lithological aspects. 8.6 Comparison of SWD and wireline VSP results. 8.7 Prediction by SWD in favorable conditions. 8.8 SWD in geologically-complex and poor-seismic-response area. 8.9 Crosshole SWD seismic survey. 8.10 3D-RVSP application. 8.11 While-drilling application of 3D-RVSP imaging. 8.12 New trends for SWD. 8.13 Geosteering. Bibliography. Name index. Subject index. 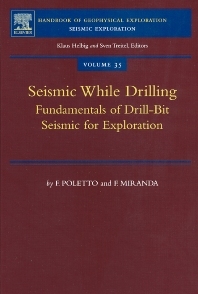 The purpose of this book is to give a theoretical and practical introduction to seismic-while-drilling by using the drill-bit noise. This recent technology offers important products for geophysical control of drilling. It involves aspects typical of borehole seismics and of the drilling control surveying, hitherto the sole domain of mudlogging. For aspects related to the drill-bit source performance and borehole acoustics, the book attempts to provide a connection between experts working in geophysics and in drilling. There are different ways of thinking related to basic knowledge, operational procedures and precision in the observation of the physical quantities. The goal of the book is to help "build a bridge" between geophysicists involved in seismic while drilling - who may need to familiarize themselves with methods and procedures of drilling and drilling-rock mechanics - and drillers involved in geosteering and drilling of "smart wells" - who may have to familiarize themselves with seismic signals, wave resolution and radiation. For instance, an argument of common interest for drilling and seismic while drilling studies is the monitoring of the drill-string and bit vibrations. This volume contains a large number of real examples of SWD data analysis and applications.